One garden tool that is essential, for the safe pruning of tree branches, specially at height, is a telescopic tree pruner. With a long, but very useful reach, of around 7-8ft (210-140cm) length, you can reach branches that you simply cannot reach with normal pruners and loppers. The best domestic long reach pruners are light weight and include both a lopper (like secateurs) and a pruning saw in one and are perfect for home use. Some models have just the one type of cutter, lopper or saw and some professional models have, interchangeable cutting equipment such as the Wolf-Garten pruning range that has a pruning saw with the option to purchase a separate lopper that fixes to the top of the pole. Below is the winner our our 'Best Pick' which after hours of research we came to the conclusion is the best telescopic tree pruner for both home users looking for a quality tool and professional gardeners looking for a tool that is reliable and affordable. Those looking for a premium product won't find a better alternative to the Wolf-Garten Anvil Tree Pruner with is 10 year guarantee and ability to prune branches up to an impressive 38mm with its anvil style pruner and the optional pruning saw blade. The Draper Expert is the winner of our 'Best Pick' and was also Awarded 'Best Buy' by Garden News. We really like the quality of the Draper Expert and being designed for professionals and landscapers gardeners as well a home gardeners looking for a quality tool. Firstly, you keep both feet in the ground, which makes pruning tall branches safer as there is no need for a ladder which can be dangerous, specially on uneven ground. Speeds up the process of pruning trees, which is essential for professionals gardeners and landscapers. 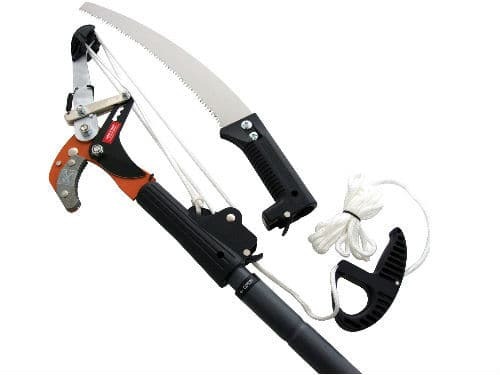 There are many telescopic tree pruners on the market from various manufactures, they range in price and quality, as mentioned above, some have both a lopper and a pruning saw fitted. In general they have a tree lopper which work like scissors for cutting smaller branches and a small pruning saw for the larger branches that are too big for the lopper. The best tree pruners are light weight, strong and stable when fully extended so that trees can be pruned with ease with minimal effort. We are a big fan of Wolf-Garten tools as they all ways come out on top when tested. The only reason it is not our 'Top Pick', is that it is designed more for professional use and not within most gardeners budget. If its within your budget, then this model is worth considering, it will prune branches up to an impressive 38mm with the anvil style pruner and comes with a 10 years guarantee for peace of mind. The Draper Expert is designed to be a quality garden tool at an affordable price and has been built with professional gardeners, landscapers as well as the average gardener in mind. 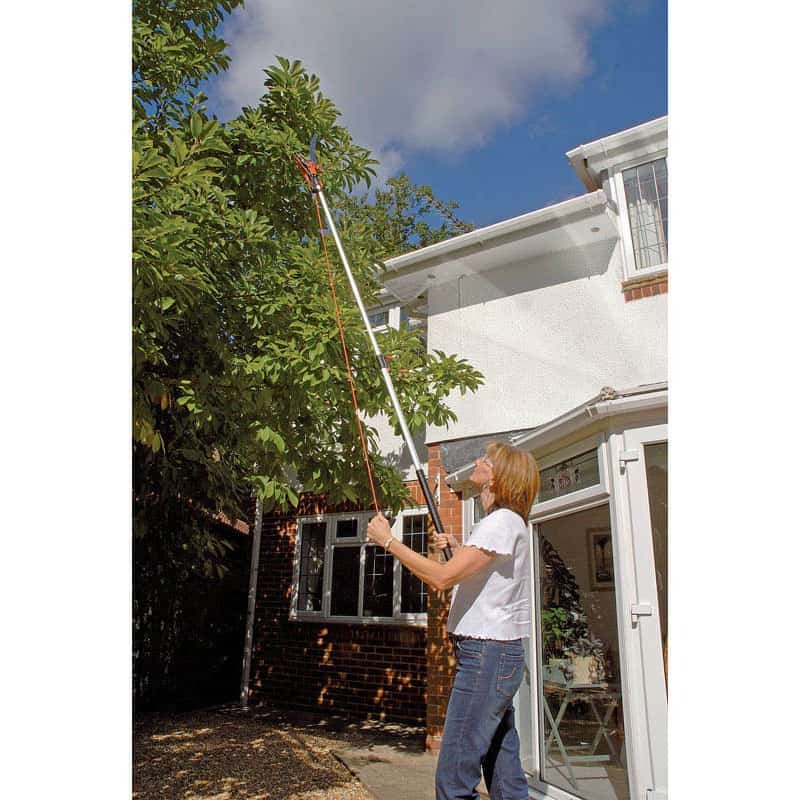 The telescopic pole is manufactured from aluminium, which means it is both light weight, strong and has a heavy duty grip handle. It has a 4 position locking system meaning it can be extended from 1.5 metres to 2.5 metres. The detachable curved saw blade is 355mm long and can cut thicker branches with ease. The nylon cord-operated pruner works like a lopper and has been designed to cut branches up to 32mm. Firstly the instructions are nearly all but useless, Draper need to include some more advanced instructions. All in all not too hard to assemble but some better instructions would makes things even better. 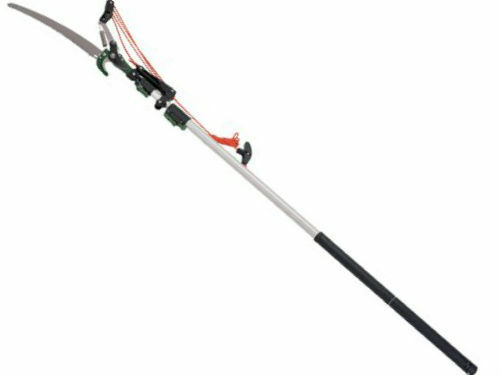 We were very impressed with the telescopic tree pruner itself, is very well made, lightweight when compared to other models and very comfortable in your hand. The business end, the lopper and the saw work perfectly so no negatives comments here. 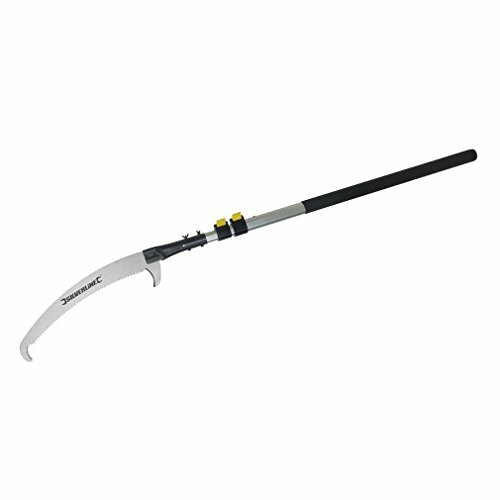 It easily cuts through 2 inch thick branches which is suitable for most tree pruning jobs. Overall a good product and well worth the extra money when compared to the Spear & Jackson model. 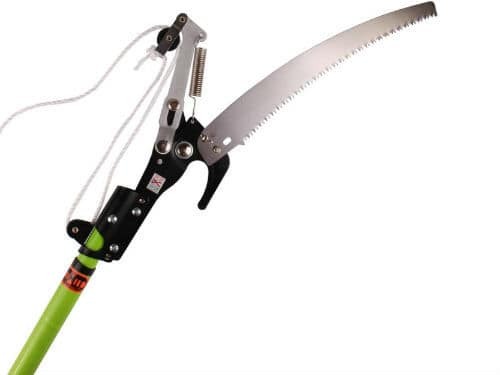 This tree pruner was also awarded a “Best Buy” by Garden News. The Silverline tree pruner, is one of the more affordable models featuring a durable, triple-ground blade cuts cleanly on forward and reverse stroke and has a long 470mm blade length. The telescopic handle can extend to 250cm which is just over 8ft long, you that that much needed extra reach for them hard to reach places. At under £30, it offers amazing value for money and does the job beautifully. The pruning is very sharp and it is surprisingly light although it can feel slightly heavy when extended fully. All in all, a very good tool which is ideal for gardeners not wanting invest quite as much as our best pick model and need a saw type pruner rather than a lopper which you usually use on smaller branches. 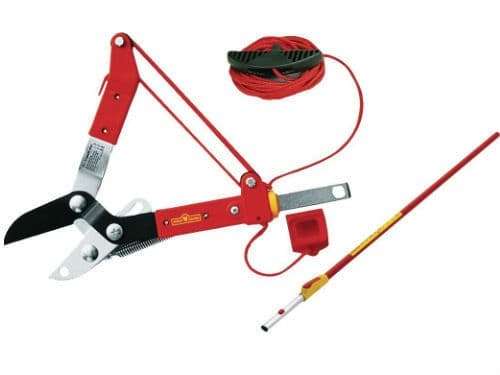 Firstly it is important to note that the lopper above is just a pruner and does not have a pruning saw included like other models of telescopic tree pruners. The saw can be purchased separately as an add-on product as shown below. The lopper comes with a 3 metre lightweight aluminium telescopic handle which has a PVC sleeve for extra comfort. It is the only telescopic tree pruners that has an anvil-style lopper and is capable of cutting branches up to 38mm in diametre, this is 8mm more than most other models. This Wolf-Garten model uses a 4:1 pulley system which makes pruning larger branches possible without having you really use too much effort. The pole that comes with the lopper is adjustable, from 170cm to 300cm in length. The pruning saw, which need to be purchased separately is of a very high quality and designed with excessive use in mind. It will cut through even the thickest branches. 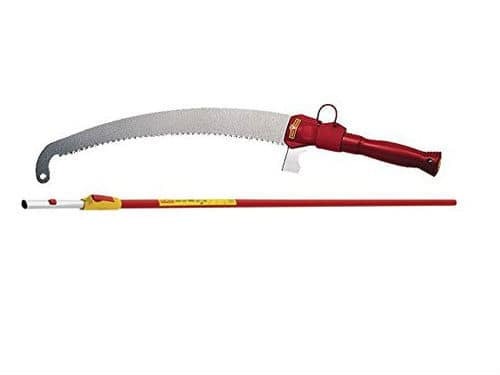 The pruning saw come with a slightly long 4 meter telescopic pole. They are simply the best loppers available but at double the price of other telescopic loppers. They are probably more suited for regular use, rather someone pruning a few trees each year. The lopper attachment and pruning saw are both lightweight and will cut branches far larger than other tree pruners and are made to a much higher standard. The downside of the Wolf-Garten range is that the lopper and pruning saw need to be purchased separately, you can buy the lopper with a 3 meter telescopic handle and then the pruning saw as an extra attachment or via versa. Overall expect to pay around £100 for both together with a telescopic handle. Overall a very high quality, high preforming tree pruner set. This Ratchet saw lopper by AM-Tech has an aluminium telescopic tubular pole which means it is lightweight compared to some other cheaper models. The tree pruner uses a ratchet style lopper which ensures easy cutting of tree branches and the detachable. non-stick saw blade is made from hardened, high carbon steel which helps strengthen the blade and make it rust resistant. The lightweight pole extends to 96 inches (approximately 2400mm) and it comes with a detachable saw for cutting through branches the pruner cannot cut. They are a good addition to the garden shed of the average gardener who needs to prune a few trees. There is a downside which seems to be the deal braker, the cord can jump off the pulley system and you need to lower the pruner to put it back on, keeping the cord tight can reduce this and it does not happen all the time but be prepared. Toolzone have tried created an affordable option which can be extended from 1500mm to 2780mm. The telescopic pole uses a twist and lock action to secure the desired length needed and is vinyl-coated to protect it from rust. It has both a bypass lopper for smaller branches which is operated by a pull cord as with other models. It also has a handy saw that is approximately 255mm long for cutting larger branches. It does do what it is designed to do, it would be ideal for someone wanting to prune a few branches that are not too big, light pruning work for example. Couple of niggling issues with this model, the lopper does seem to get stuck shut more often than other models do. This means you need to lower the lopper, to open them again as the problem is usually a smaller peace of branch caught in the jaws. It can also be difficult to cut branches with the saw as there is too much movement in the pole. We do really like and was very impressed with the Draper Expert telescopic pruner ('Our Top Pick') and the cheaper Silverline telescopic pruner as both were quality products that preformed well as well as offering good value for money. We feel the Draper expert telescopic pruner is the better choice of the two, but is a little more expensive. However it still offers good value for money compared to other similar tree pruners and would be within most gardeners budgets when considering which one to buy. 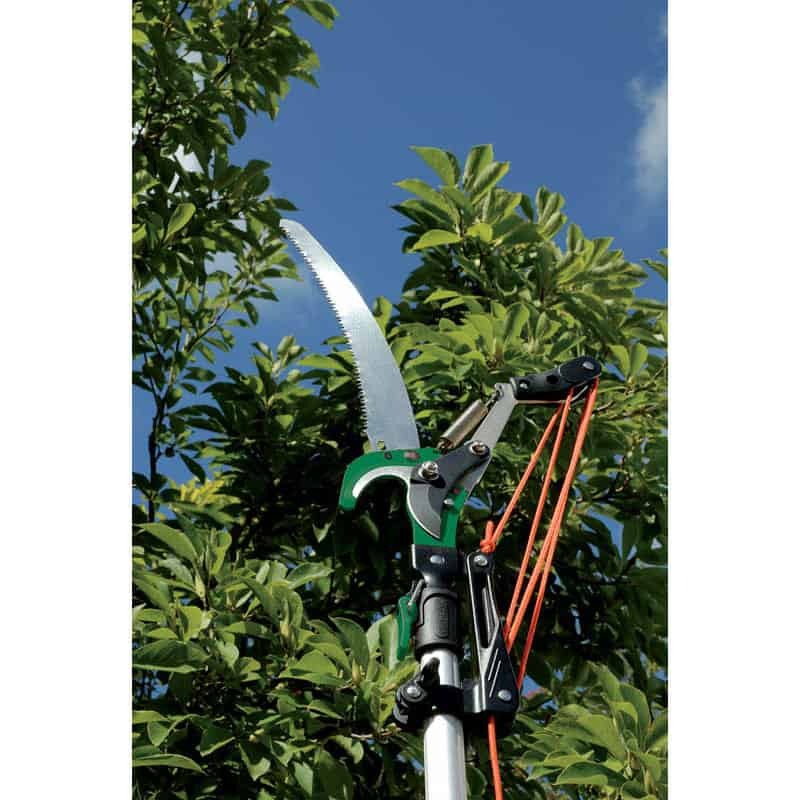 If you're after a professional, very high quality tree pruner that is more suitable for landscape gardener’s, more intensive use or simply want to invest in a very high quality tool, then the Wolf Garten Anvil tree pruner (available here) would be the best choice. We look at 5 amazing garden shredders to see which is the best garden shredder overall and how they compare.